Two 17-knot high-speed research vessels for the U.S. Geological Survey are scheduled to be dedicated at Great Lakes Shipyard, Cleveland, Ohio, on Wednesday, August 31, 2011. 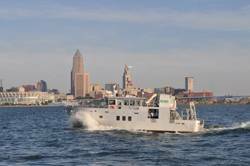 R/V KAHO and R/V MUSKIE will replace two of the USGS’s oldest research vessels by the same names that are currently operating on Lake Ontario and Lake Erie, respectively. The USCG’s five-vessel fleet supports missions that collect and analyze oceanographic and fisheries information. The U.S. Department of Interior’s U.S. Geological Survey’s Great Lakes Science Center, Ann Arbor, Mich., works to scientifically restore and protect the Great Lakes ecosystem. The GLSC awarded The Great Lakes Shipyard an $8.2 million contract for the two vessels in June, 2010. The 14-month project created 41,000 shipyard construction hours, the equivalent of 5,125 man days of employment which is 20 Shipyard jobs for one year. The vessels were designed by Murray & Associates, Fort Lauderdale, Florida; and Alion Science and Technology, Inc, McLean, Virginia, supervised construction. The Honorable Anne Castle, Assistant Secretary for Water and Science, U.S. Department of the Interior, will be the ceremony’s principal speaker and sponsor of the R/V KAHO. Dr. Marcia McNutt, Director, U.S. Geological Survey, U.S. Department of the Interior, will also be a speaker and sponsor of the R/V MUSKIE. The Great Lakes Shipyard, a division of The Great Lakes Towing Company, has a full-service shipyard with a newly-christened 770-ton Travelift and a 250-ton dry dock. The Company is currently in the fourth and final phase of its Shipyard Expansion Project which is to be completed by July, 2014.